Brushable elastomeric waterproofer that combines water soluble polyurethane resins modified with specific acrylic dispersions. Apply it to create a seamless membrane that is impervious to water, that provides excellent roof protection for up to 10 years. Certified by the University of Athens, (Department of Applied Physics) as ‘Cool’ material of low thermal conductivity, and high reflectivity in the visible spectrum at a rate of 93%. 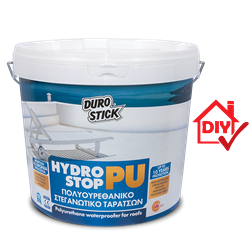 Suitable for waterproofing roofs, terraces, parapet walls, gutters, drywall, and cement board as well as properly installed and well adhered asphaltic roofing roll. The product does not require the addition of reinforcing polyester mesh. Classified as product for surface protection of concrete surfaces per EN 1504-2. •Minimum consumption: 0.75lt to 1.2lt/m2 for two coats, depending on the substrate. •1.2lt to 1.5lt/m2 for three coats, depending on the substrate (protection for 10 years).